Summer is approaching in Sydney but when we look out the window, it doesn’t look the case at all! The sky is overcast and the temperature is still relatively cool. 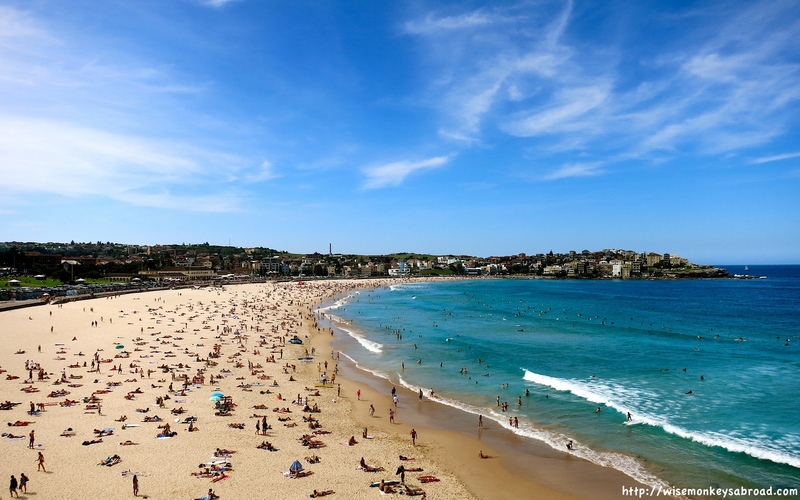 Considering that we live only 20 minutes or so from the beach, we hardly ever visit the beaches in Sydney. Maybe once or twice during the summer… And beautiful beaches we certainly have. To put it plainly, we are just not beach people. …we would have to say that it isn’t here in Sydney. 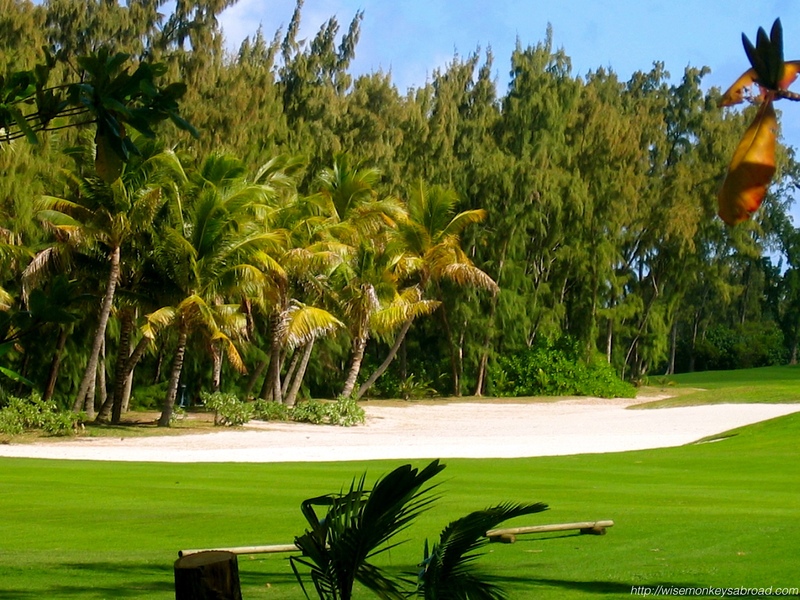 Back in 2006, we went to Mauritius for a week and found what we consider to this day: paradise. We think it is the best beach that we have ever been to. 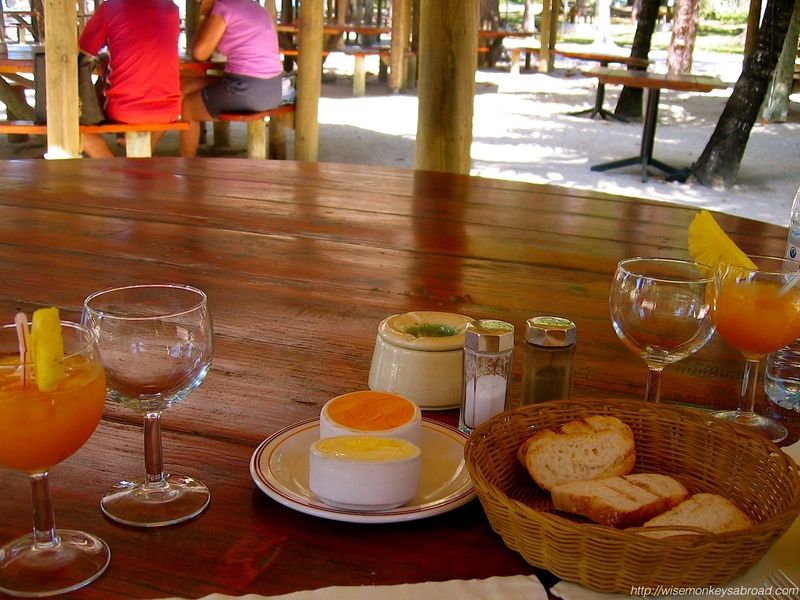 Ile aux Cerfs is a privately owned island off the east coast of Mauritius. To get there, we were picked up from our hotel in Port Louis (on the west coast), driven across country to the port, before jumping on a boat transfer to the island. And when we arrive, all we see is beautiful turquoise water and soft yellow sand, water so calm; this was our kind of beach. 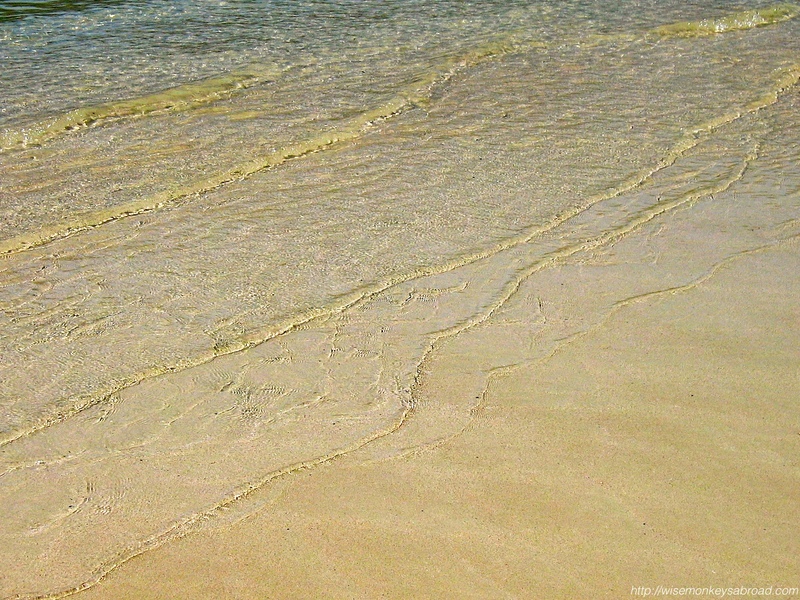 We throw down our beach towel by the lagoon under some shade, and just head into the water! 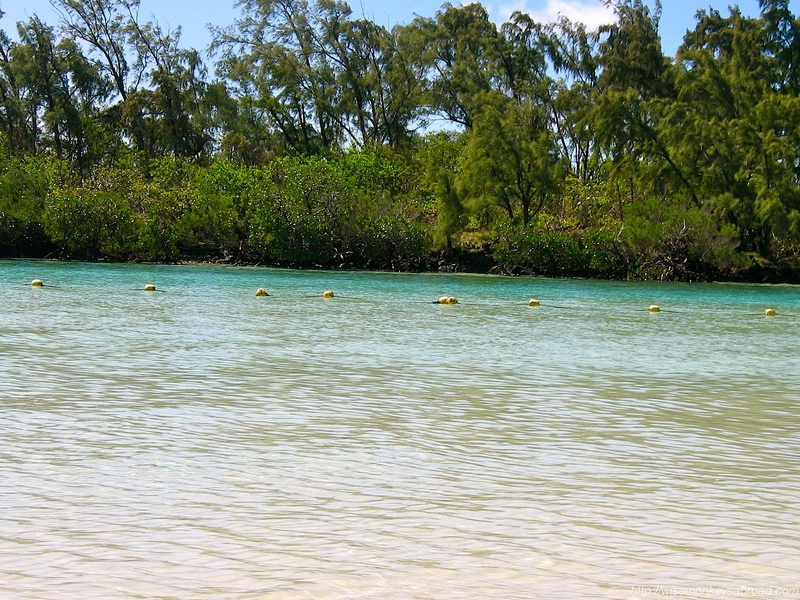 It doesn’t matter how far we go in this lagoon, the water is merely ankle deep and then slowly becomes knee deep. We can sit in the water and just soak up the sun and atmosphere. No fear of being slammed by waves or snuck up upon by sharks. Here is the place to be lazy and relax! 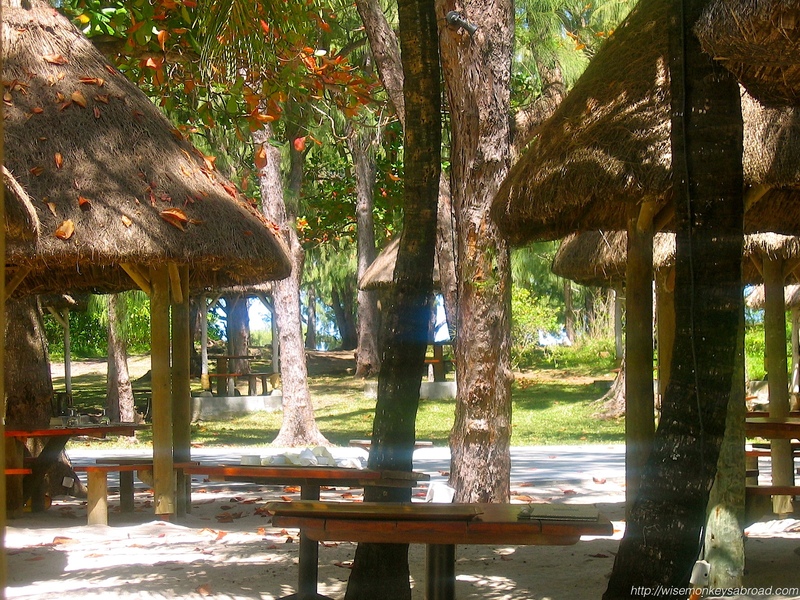 Our day trip also included lunch – all set up and served under these open huts! And then to sticky beak around the island afterwards, we walked along some of the walking tracks and caught glimpses of the golf course. Share yours to inspire us! 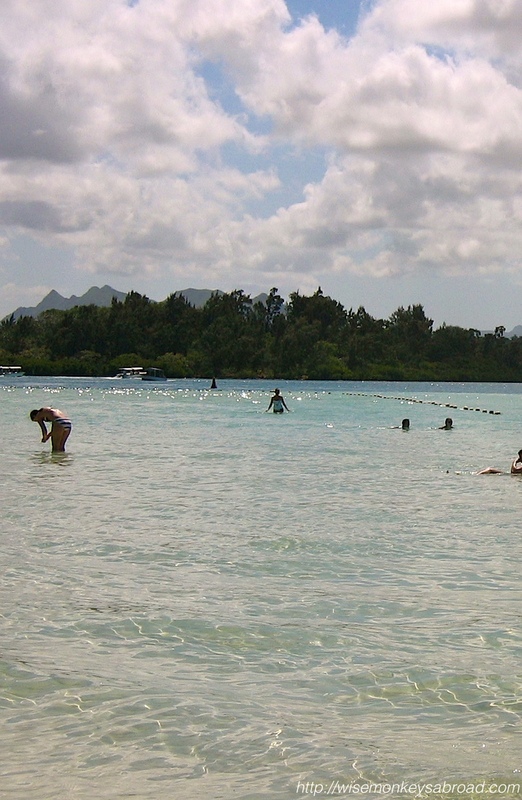 This entry was posted in Africa, Mauritius and tagged beach, favorite beach, favourite, Ile aux Cerfs, Mauritius, Photography, picturesque, relax, summer, Travel. When we saw today’s Daily Prompt: Close Call, we knew we had to write about two experiences that happened to us while travelling, as told by Mrs WiseMonkey. Have you ever felt a feeling or an inkling that you couldn’t quite explain? Then it finally dawns on you that it was your instincts all along & that some greater being out there is looking out for you. Bet I am making absolutely NO sense whatsoever at this point but please bear with me for a few more paragraphs before running away. Let’s retell a story so you know where this post has come from. Back in the early months of 2013, we were both dead-set on going to Africa. 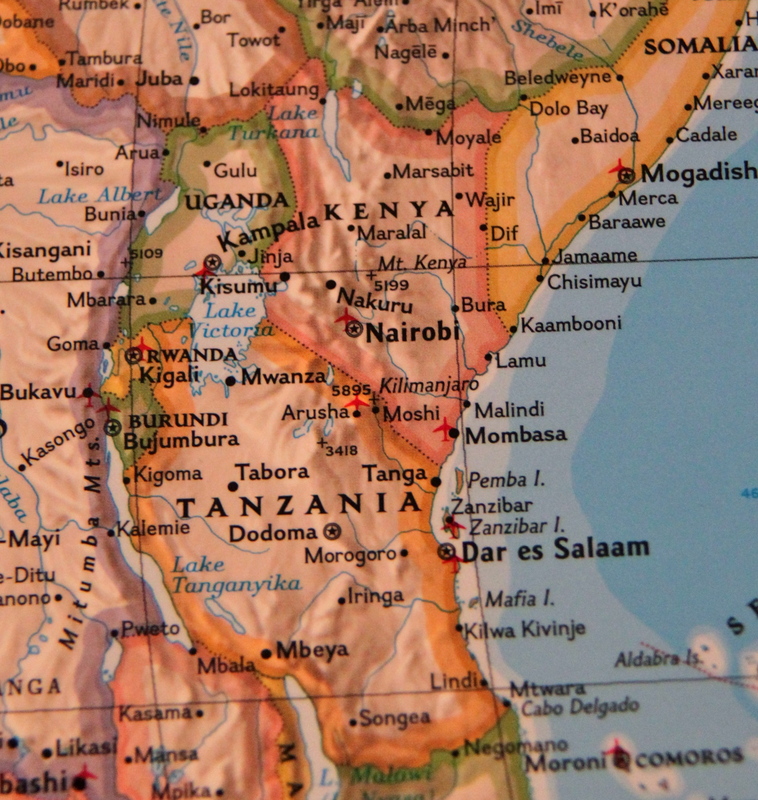 A safari through Kenya and Tanzania is something we’ve always dreamed about and so we booked it. As the weeks and months rolled on, we got our vaccinations, got prescriptions for malaria tablets, even got as far as applying for our visas. Me: Are you sure we want to go Africa? We still have time to change our minds. Him: What makes you say that? Me: I’m not sure. I’m just checking that this is really what we want to do. The balance for Africa is due next week, and we just need to be sure that’s where we want to go. Him: Well, where would we go instead? Me: I dunno. There’s plenty of other places we want to see. Him: Ok, well, let’s have a think and then decide…. Similar conversations ensues each day for another 2-3 days, and for some reason, I recall feeling like a nag but I also remember feeling we urgently need to make a decision. So we settled on Turkey. I thought nothing more of it until September 21, 2013 – when we were meant to be in Nairobi, we were in Istanbul instead, not realising what was happening in Nairobi. Militants had stormed a mall and were holding hostages and killing people indiscriminately. When I found out about this 3 days later while Skyping my family, I got goosebumps and I wanted to cry! I actually want to cry now while I write this 2 months on. The automatic questions that flew through our heads when we had heard this: Could we have been at that mall? Would we have been lucky to escape or possibly been one of the victims? Would our holiday have been tainted by being in a country where so much pain had just been caused? Would we feel safe anymore or want to jump on the next flight back home? So many questions where we would never know the answers. The only thing we know is that we went with my instinct to change our plans and were now safe! Close Call Number 1. You see, this story may seem coincidental or pure luck but this isn’t the first time something like this has happened. Beginning of this year, when we were flying back from Orlando, we had a massive layover in Los Angeles. We normally get a room at Hotel Hacienda to freshen up until our flight home. This time we had booked a hotel at Santa Monica to spend some time by the nicer part of town and we were really looking forward to going there. It had been 4 years since we were last there and wanted to just enjoy the day. You know what? I actually don’t feel like going to Santa Monica today.I don’t know why but I would prefer if we just go to Hotel Hacienda near LAX like we always do and just chill out. I know we’ve already paid for Santa Monica but to justify paying for another hotel, it will cost us the same to catch a cab to and from the airport to Santa Monica anyway. So technically we break even. That seemed a reasonable explanation to hubby so he agreed. It was that evening as we turned on the TV in the hotel to watch the news that we found out that there was an armed robbery in Santa Monica and there were police car chases through the streets with 2 gunmen: with one allegedly loose on foot by then. When we looked up on google maps where this was all happening, it was one street away from the hotel we would’ve been staying at. Hubby turned and looked at me and dropped the remote control he was holding. I was stunned myself. Close Call Number 2. This entry was posted in Africa, General Travel Musings, USA and tagged Daily Prompt, Kenya, Los Angeles, Nairobi, postaday, Santa Monica California. 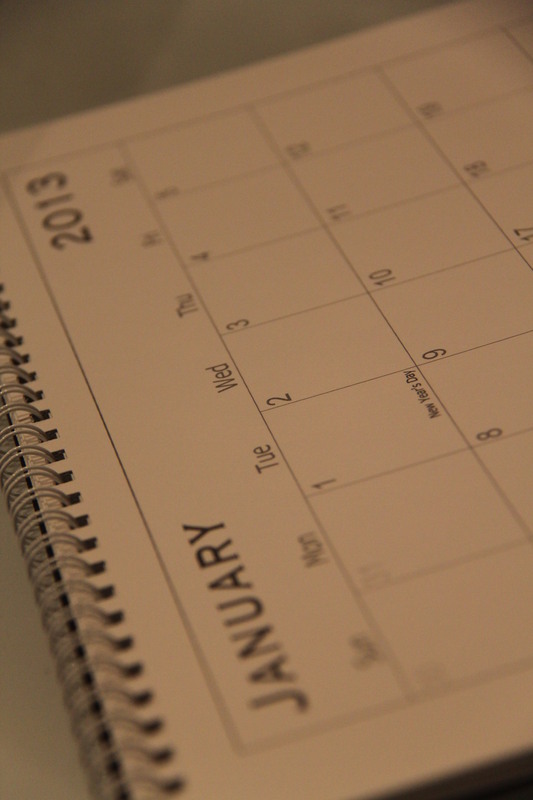 We are really enjoying participating in the Weekly Photo Challenge…. 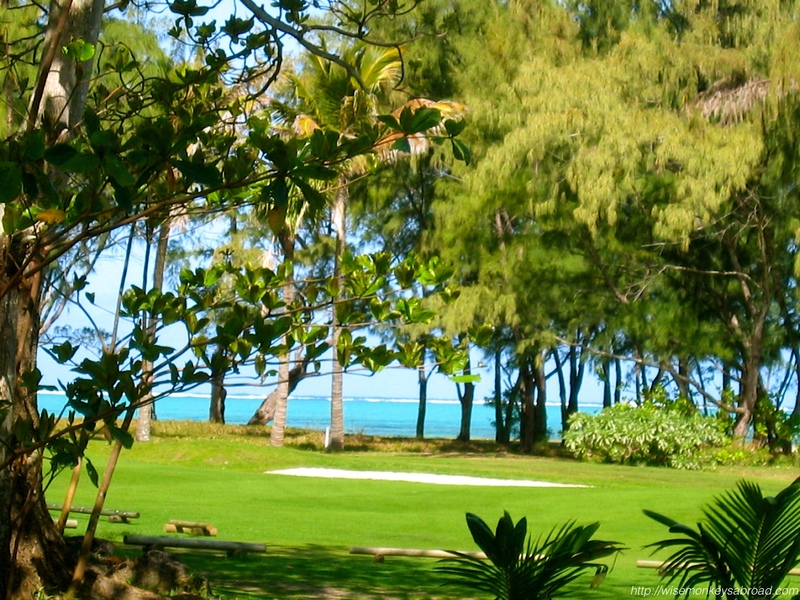 Our choice of photo this week to represent LAYERS is a photo we took in Mauritius back in 2005. 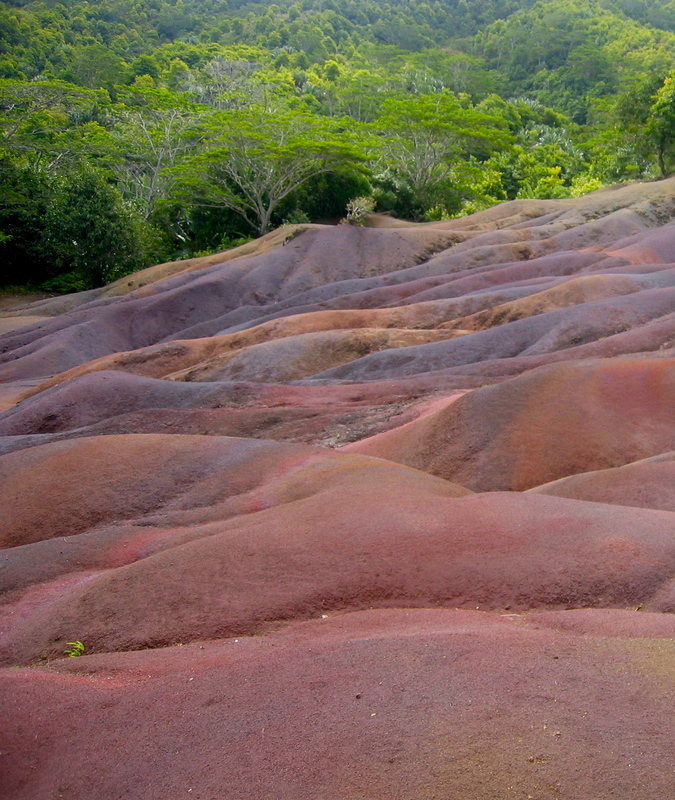 This is “Chamarel Seven Coloured Earths”. Bascially it is a geological formation where the seven different coloured sands have settled in different “layers” causing the colouring phenomenon. This entry was posted in Mauritius, Weekly Photo Challenges and tagged colours, Mauritius, photo, Photography, postaday, Seven Coloured Earths, Weekly Photo Challenge. 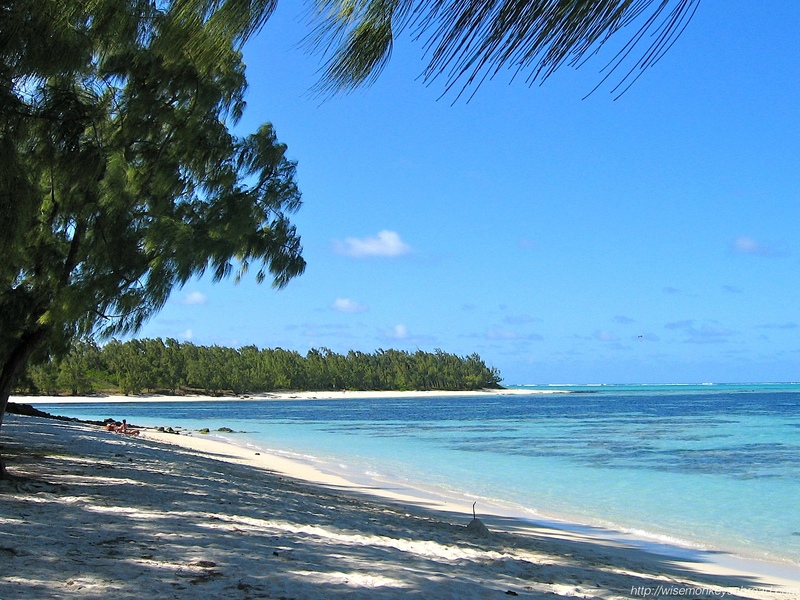 Hearing Mauritius always conjures up images of exclusivity, honeymooning, palm trees and beaches. And we suppose that those are the right images. But, there has to be more… and there is! We arrived into Mauritius later than scheduled and were promptly picked up by the transfers. But as we drove into the night, we began wondering what we had gotten ourselves into. Was this a tourist trap? Were those idyllic images all misleading? Why did we feel this way, you ask? Well, we were driven in a van along roads that were NOT well-lit, actually pitch black to say the least and the only light we could see were spot fires off in the distance – and as the van sped on, the fires got closer and closer. We soon learnt that they were sugar cane harvesting and not anything more to worry about. Sure enough, upon driving up to Le Meridian, all of our worries dissolved. The resort was amazing! We could not fault it in any way other than to say it was so big :-), our legs got sore from walking to the room. The view from our room was spectacular. A week of relaxing was in store. But after one day of relaxing at the resort, we got itchy feet and wanted to do some exploring so we booked in a few day trips to see more of the island. We had not flown all this way from Sydney to sit by the pool – you can do that ANYWHERE! We visited Port Louis, temples, waterfalls, markets, volcanoes and truly got a taste of the real Mauritius that lay beyond the resort. Amazingly how many people at the resort had not ventured out the gates – they didn’t know what they were missing! One particular thing we were ever so keen to see were the giant water lily pads at Pamplemousses Royal Botanical Gardens. Having read in travel guides, we were ready to be blown away. Its pretty obvious already from this build up, that it was a let down. 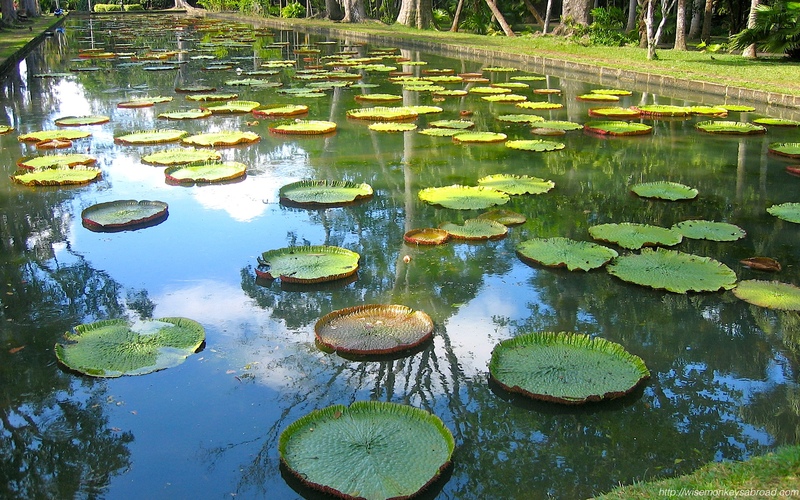 Sadly, Mauritius had experienced a wet winter and therefore the lily pads were not as big as normal. 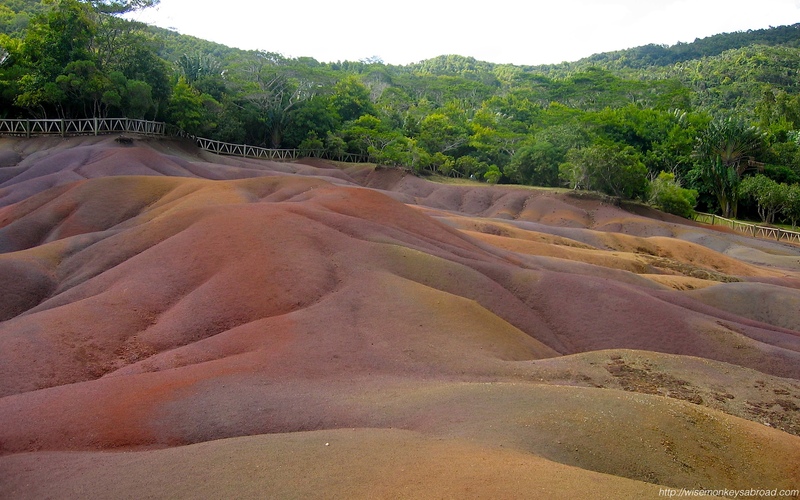 One thing that we hadn’t expected to see was Chamarel – which we didn’t know about until we were in Mauritius. It is basically a geological formation made up of dunes comprised of seven different colored layers. The colours were incredible. 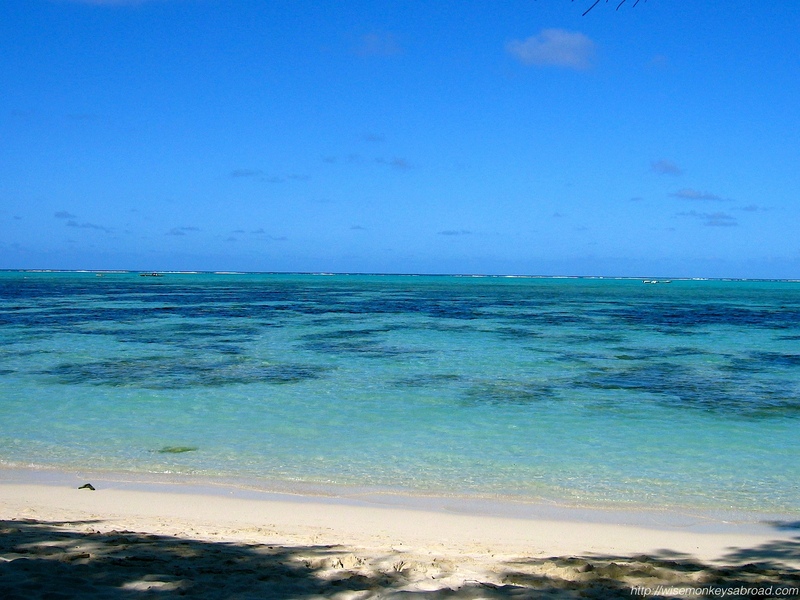 As far as beaches go, Ile aux cerfs has to be one of the nicest we’ve ever seen. It was a lagoon in fact but that doesn’t stop it from being picture perfect and the spot to relax. View more photos of our trips in our Photo Gallery. 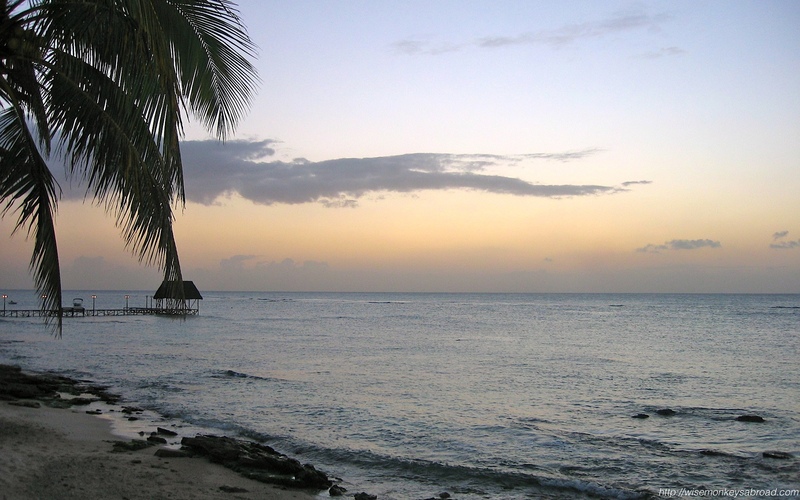 This entry was posted in Africa, Mauritius and tagged beaches, Chamarel, Ile aux Cerfs, Mauritius, Port Louis, Travel.